Brisbane - After a stellar day with the bat and in the field on Sunday, South Africa's Jacques Kallis declared himself fit and ready to play his part with the ball in the last two days of the first Test against Australia. Kallis scored an impressive 147 to help South Africa to a first innings total of 450 at the Gabba and then helped in the removal of two top order Australian batsmen with slip catches as the hosts were reduced to 111-3. The 37-year-old missed South Africa's only warm-up match for the Tests with a chest infection but said there would be no problem if skipper Graeme Smith tossed him the ball on Monday. "I'm ready to go," he told reporters. "It's managing the workload as well, just got to be careful with that, but as far the body goes, it's alright for the moment." With 12 788 runs, 280 wickets and the third highest number of catches (189) taken by a player in the longer form of the game, Kallis's status as one of the greatest all-rounders of all time is secure. And with a newly transplanted head of hair, he shows absolutely no sign of contemplating the end of a Test career that began back in December 1995. "I'm happy with the way I played," he said. "It was tough this morning. I thought Oz bowled really well and got the ball into good areas. "I think I've been playing pretty well for the last couple of years," he added. "I feel I've been getting into good positions. Hopefully I can carry on that, and you need a little bit of luck to go with that as well. Long may that continue." Kallis has seen plenty of partners come and go in his 156 Test matches and in Brisbane he put on 161 for the third wicket with the top ranked batsman in the world at the moment, Hashim Amla. Amla also scored a century as the Proteas piled on the runs but his innings was brought to a close with 104 on the board by an lbw decision that would have almost certainly been overturned had South Africa appealed. 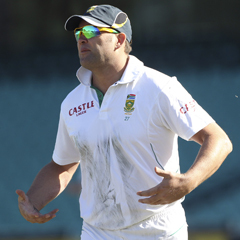 Kallis said he had spoken with his Amla at the crease and suggested he refer the umpire's decision. "It was a chat that we had, I said I thought it was the height that was maybe the issue there but he felt it wasn't going to go over because the umpire had given it," Kallis said. "It was a tough one to call, maybe I could have said just refer it because you do have two, so maybe I could take a bit of blame for that as well." If it was a misjudgement, it was a rare one for Kallis on Sunday, and he was particularly pleased to have snared an edge from his contemporary Ricky Ponting to send the former Australian captain back to the dressing room for a duck. "Nice to get a guy like him out early, he's one of the best players in the world and we need to keep asking questions of the Australian top order," he said. "If we can nip out a couple tomorrow morning and put some real pressure on Australia, who knows? I think we've just got to give ourselves opportunity, I think the game's far from dead."